T cells are a sub-group of white blood cells known as lymphocytes and are responsible for cell-mediated immunity. These T-cells have a T cell receptor (TCR) that differentiates it from other lymphocytes. Natural killer T (NKT) cells are a heterogeneous group of T cells that share properties of both T cells and natural killer (NK) cells. Cancer cells have a property that prevent NKTs from performing its duty. Scientists have found a way to circumvent this and allow natural killer T cells to go ahead and attack cancer cells and other disease causing cells such as HIV. In a study published in Nature Medicine, Loyola researchers report on a promising new technique that potentially could turn immune system killer T cells into more effective weapons against infections and possibly cancer. The technique involves delivering DNA into the immune system's instructor cells. The DNA directs these cells to overproduce a specific protein that jumpstarts important killer T cells. These killer cells are typically repressed in patients who have HIV or cancer, said José A. Guevara-Patino, MD, PhD, senior author of the study. Guevara is an Associate Professor in the Oncology Institute of Loyola University Chicago Stritch School of Medicine. 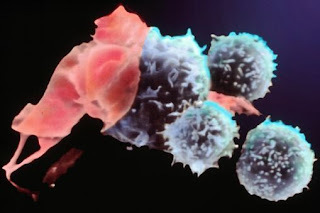 The study involved killer cells, known as CD8 T cells, and their instructor cells, known as antigen-presenting cells. The instructor cells instruct CD8 T cells to become killer T cells to kill infected cells or cancer cells -- and to remain vigilant if they reencounter pathogens or if the cancer comes back. In the study, snippets of DNA were delivered into skin instructor cells by a device known as a gene gun. The DNA directed the instructor cells to produce specific proteins, which act like molecular keys. When CD8 T cells interact with the instructor cells, the keys unlock the CD8 T cells' killer properties -- jumpstarting them to go out and kill pathogens and cancer cells.